Why Is Mamak So Much Like Hawkers? Mamak is a terrific new place to eat Asian street food. It's a handsome spot with an expansive menu of small dishes meant to share, from pad Thai to coconut shrimp. Yet I'm stumped. The menu--not just the offerings, but also the execution--is nearly a duplicate of the one at Hawkers, a nearby establishment. Why is Mamak so much like Hawkers? I like having a choice, don't get me wrong. Hawkers is a family favorite. Its spiffy if budget dining room is often so packed that we have to wait for a table--and we're willing to, which we won't do elsewhere. I sure would like to know the back story, though. While the Mamak bill of fare offers far more than Hawkers does, much of the line-up is a carbon copy. Take the roti canai, flaky bread with a curry dipping sauce. We order it every visit and always want more. Not only does Mamak's look just like Hawkers' version, it tastes the same too. The beef skewers, pictured above, are a bit different: They're more caramelized at Mamak, which I prefer, but don't come with a spicy peanuty sauce, which I miss. The barbecued roast pork is pretty spectacular, with its sweet outer area and tender insides. The hoisin dipping sauce is a plus. The sesame noodles were a little pasty at Mamak. Still, I'm glad the cold, kid-friendly item is on the menu. Until a couple of years ago, we could barely find this dish in Orlando. I don't recall seeing wontons in hot sauce on Hawkers' menu. 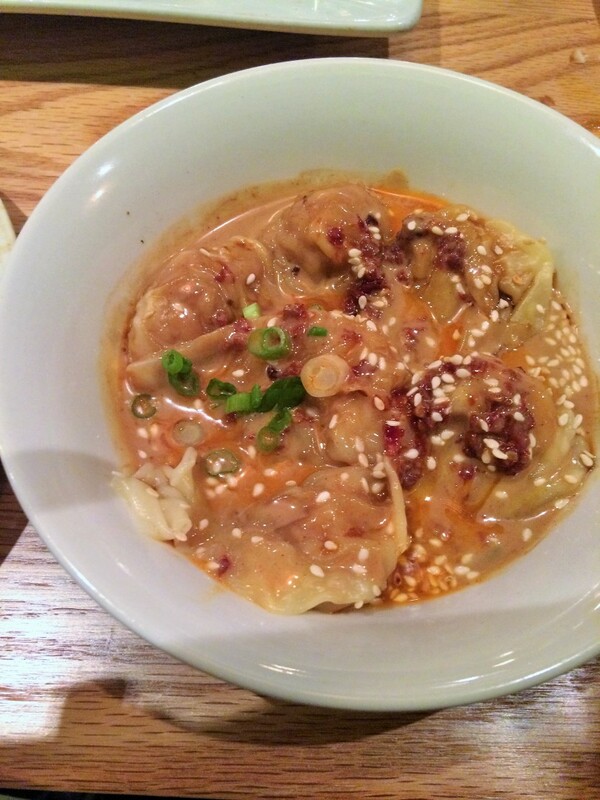 These peanuty, spicy dumplings are a treat. Maybe Hawkers should do the carbon-copy thing itself. French fries with five-spice powder? Both restaurants. Coconut shrimp? Both. Lettuce wraps, chicken tacos, stir-fried string beans ... I could go on. In fact, both restaurants use Facebook pages as their websites, which usually only smaller spots do. I'm happy to have a second Asian street food restaurant in Orlando's Mills 50 district, and I'm glad the food is promising. If you know who owns this grand space, and why it's so doggone similar to Hawkers, please let me know. Otherwise I'll do a feature for a print magazine at some point and do intense digging myself.